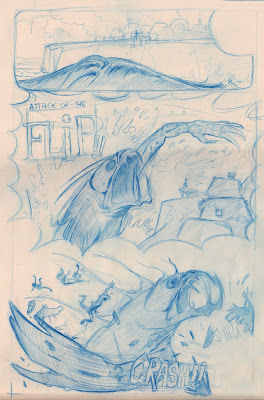 Home » Blog » FLIP comic, roughs finished! 8 rough pages already done and scanned! now is time to start the inking and coloring process..! Still haven´t decided on the final style, and also I need to re-think some of the panel layouts that I´m not too convinced about. I´ll try to keep posting the process as I go. Me gusta mucho y la historia me parece muy divertida… tengo ganas de ver como le vas a dar el color… seguro que me encanta!! Cool man I did not get to check out your sketchbook, but I could tell with your post is gonna be action packed..
Ganas tengo de verlo terminado! Mola mucho esa alimaña a lo Segrelles! cool – can’t wait to see the inks!